This unique Sanding Detailer from Lumberton Industries was specifically developed for those hard to reach sanding jobs. Unlike other sanding products, this tool gives you three different work surfaces - a tapered end for intricate areas, a rounded end, and a 3-1/2" flat work surface between thumb supports on the bottom of the tool. 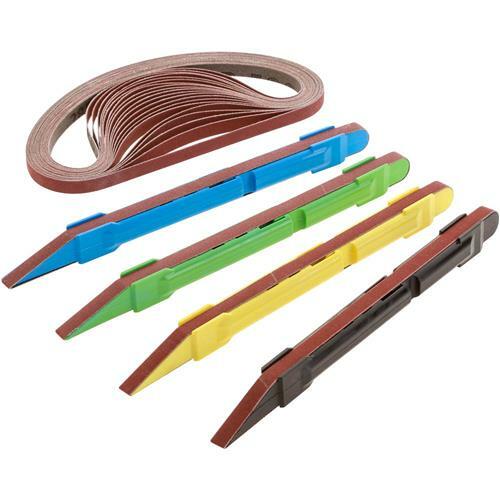 What's more is you use the entire sanding belt; simply adjust the enclosed spring that provides belt tension and move to a fresh area of the belt. You will be able to sand with ease all those areas that were once such a problem to reach. Great for woodworking, metal finishing, ceramics, auto body finishing, and so much more! 1/4" wide and 6" long.